Maddi Alexander is the luxury home and beauty collection with a conscience. This is a truly extraordinary gift presenting fashion, etiquette and luxury as one prestigious collection. Included is the Maddi Alexander Amorous classic candle. A fragrance you can feel, warm, intense and so embracing. A blend of cedarwood, atlas, bergamot, clove. This woody aroma has been blended to calm and soothe the senses. This is presented in the highly regarded branded bag. Also included is a delicious bottle of award winning Champagne, Laurent-Perrier. This elegant champagne is memorable for its freshness and finesse,a perfect introduction to the unique spirit of Laurent-Perrier. 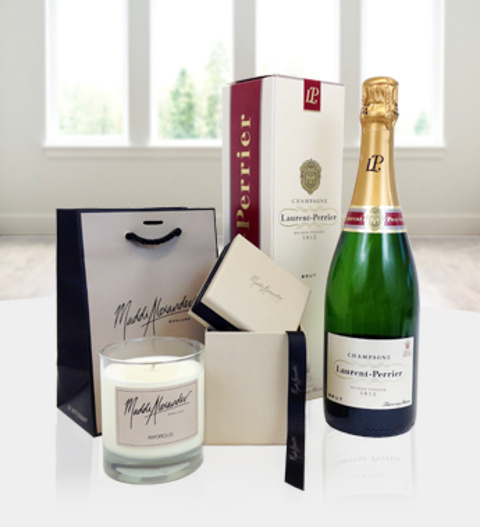 This luxury gift is perfect for those who enjoy the finer things in life. The Maddi Alexander Luxury Collection is available for UK next day delivery.